In the upcoming 'Anderson' week there's only one must-see: Stephen Colbert. None of the ohter guest or co-hosts interest me. ATA Team - please pretty please include the Colbert segment on this website. 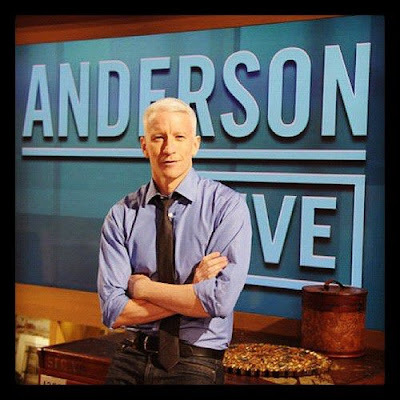 Colbert has said he's a fan of Anderson's but I have a feeling he's going to be snide about Anderson's daytime experiment. I predict 'Anderson' will maintain the 1.0 Nielsen. There will be bumps up and dips down but overall viewers will not increase consistently. I predicted Katie would come out on top for a "rookie," and she's no rookie, really. ABC has been after her for years and Anderson Live is dead. He's filled with big names that stay on for what 5 minutes max. The mere fact that some areas of the country opted out, like mine, and for two double hours of " The People's Court," tells me affiliates aren't buying him. Hopefully Andy Cohen will pull his friend aside and tell him what he needs to be told. And while Anderson may be even with Wendy Williams, even she has a more exciting hour. I've seen it, and it's much better than his. 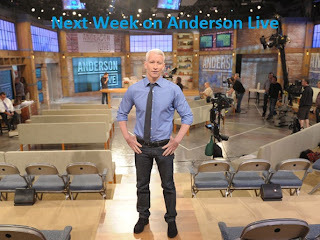 Anderson seems to think that the more big names he gets, the better his show will be, and it has nothing to do with him as a host. He probably told his producers that last year his guest list was not up to par and this year he wanted top A listers. Well, he got them and now he does not know what in the world to do with them. On CNN he said Larry King was not a good lead in. Well now he has Piers Morgan, who is doing quite well, and what's his problem now? Let's start by taking responsibility. The million mark can be deadly. If he remains consistant, then he has a chance of staying. Falling below a million....is not good. This is not cable folks.